Why Is My Heat Pump Running on AUX Heat Mode? So, your heat pump switches to “AUX heat” when it’s in heating mode—and you’re wondering if it’s normal. First off, AUX heat refers to your heat pump’s auxiliary (backup) heat source. Auxiliary heat kicks on when your heat pump can’t produce enough heat to warm your home by itself. Before we get more into when your heat pump should run in AUX heat mode, let’s go over how a heat pump heats your home. Is your heat pump in auxiliary mode when none of the 3 situations above apply? That usually indicates malfunction, which likely means your heat pump needs a repair. Call us at (512) 396-8183 or schedule an appointment online. We’ll send a tech right over. To heat your home, a heat pump works like an air conditioner in reverse: it extracts heat from the air outside and sends it into your house. Because heat pumps only transfer heat (not generate it like a furnace), they’re a highly efficient form of heating. We cover heat pump operation in more detail in our blog, “Heat Pump vs Conventional Air Conditioner in San Marcos, TX”. How does auxiliary heating differ from normal heat pump heating? Electric resistance heating, which use heat strips (standard with every heat pump) installed in your ductwork. This type of heating is highly inefficient. Gas furnace. Called a “dual-fuel system”, the gas furnace kicks on when the heat pump can no longer efficiently pull heat from the cold air outside. Dual-fuel systems are much more efficient and keep you more comfortable than electric resistance heating. 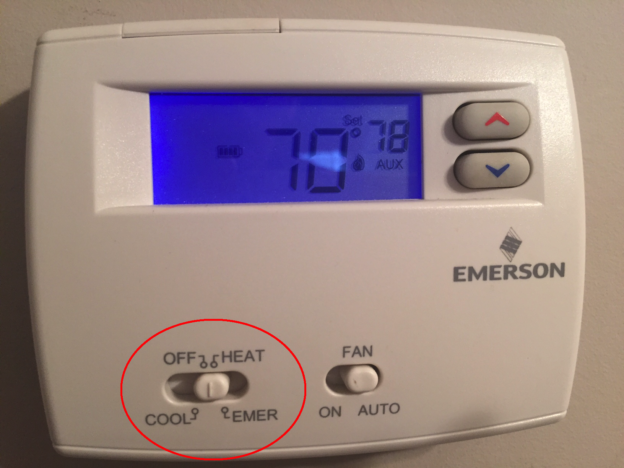 Note that auxiliary heating is not the same thing emergency heating (displayed as “EM HEAT” or “EMER” on most thermostats). While auxiliary heating indicates that your heat pump automatically switched from normal to auxiliary heating, emergency heating is a setting that allows you to manually set your system to auxiliary heating. You should only use your heat pump’s emergency heating mode when it’s truly an emergency (e.g., your heat pump isn’t working in winter) because manually overriding your system means it won’t run as efficiently as it can—which will result in higher energy bills. Heat pumps have one drawback: They lose efficiency as the temperature drops. Heat pumps are highly efficient to about 32°F. Below freezing, your heat pump simply can’t draw enough heat from the cold air outside and will kick on its auxiliary heat mode to generate heat for your home. So, before you call a professional to diagnose a problem, check the outdoor temperature. If it’s an unusually cold day in San Marcos, don’t be surprised to see “AUX heat” on the thermostat. This happens because your system is trying to generate a lot of heat to warm your home quicker than it would with normal heat pump heating. Once the inside temperature reaches the set thermostat temperature, your system should go back to using normal heat pump heating. To avoid this problem, we recommend limiting how often you raise the temperature more than 2–4°F. Although we don’t get a lot of sub-freezing temperatures in San Marcos, your heat pump could enter what’s called “defrost mode”, which prevents your outdoor unit from freezing over. In defrost mode, your system will essentially run in cooling mode for a few minutes to allow the coils in the outdoor unit to warm up. You’ll know your system is in defrost mode if the outdoor fan has stopped circulating and you see puffs of steam coming from the unit. Some models even have a blinking light on the outdoor unit that indicates your unit is in defrost mode. During defrost mode, your system will use auxiliary heating to heat your home in the meantime. The heat pump should kick back to normal heating mode after a few minutes. Think your heat pump isn’t working properly? Call a San Marcos tech. We’ll come diagnose the problem and repair your heat pump. Learn more about what to expect when you hire us on our heat pump repair page. How Much Does a Heat Pump Repair Cost in San Marcos, Texas?